Seth Peterson Cottage | Mirror Lake State Park Visitor's Guide - Baraboo Wisconsin. 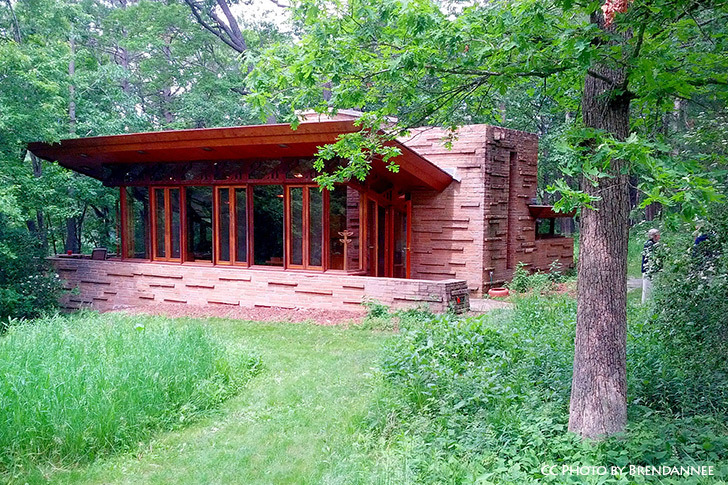 The Frank Lloyd Wright designed Seth Peterson Cottage is something unique at Mirror Lake State Park. Seth Peterson was a Wisconsin native with a lifelong interest in Frank Lloyd Wright’s work. In 1958 he convinced Wright (who was 90 years old at the time) to design the cottage. Peterson however, did not live to see it completed. The Wisconsin DNR bought the property in 1966 and added the land to Mirror Lake State Park. The cottage was not maintained and slowly began to crumble. In 1989 concerned citizens founded a non-profit group to save the cottage and give it a new life. After a cost of $300,000 the restoration project is now complete. Today visitors are invited to a monthly open house the second Sunday of every month from 1 to 3:30p.m. Admission is $4 per person. The Cottage is also available for rent through Sand County services. You can contact them at (608)254-6551. For More Information See: Seth Peterson Conservancy.